Respected invitees posing for a group photograph with community members. Phil Twyford, Minister for housing and transport, Member of Parliament and Cabinet Minister. Kanwalij Bakhshi, Member of Parliamnet. Chris Carter, former Minister of Education and Ethics. The gathering was a great success with a special presentation by young children to showcase the philosophy and functioning of vital community initiatives such as the good loan scheme Qardan Hasanah and the community kitchen kitchen FMB. 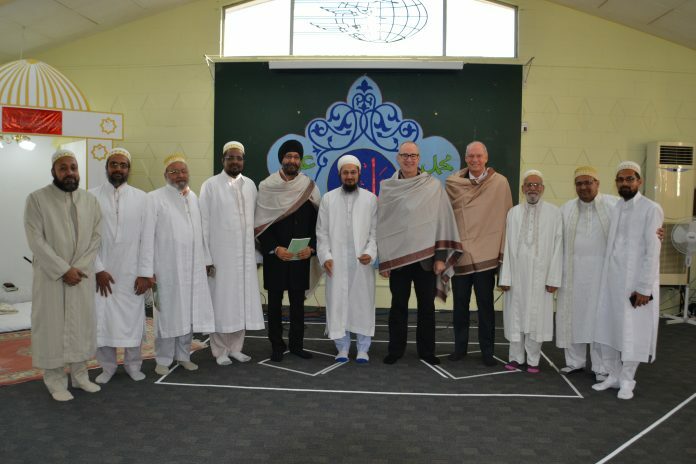 The guests were presented with the traditional shawl and enjoyed a hearty Eid meal.